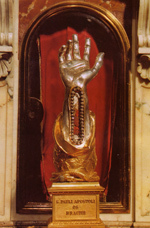 The Curious Yarn of Paul's "Shipwreck"
Wonder of wonders, the Church of St Paul's Shipwreck, Valletta, Malta, claims to possess "a portion of the right wrist bone" of the apostle. What the jewelled reliquary actually contains is anybody's guess. This dubious relic is unlikely ever to be subjected to the rigors of scientific examination. Its authenticity was vouched for by the Sacrist to His Holiness Pope Pius VII and several other early 19th century papal worthies. Paul (and all 275 others on board) survived shipwreck on Melita. According to the yarn, after a three-month stay on the island, Paul kept his date with destiny by taking another ship bound for Puteoli (near Naples). 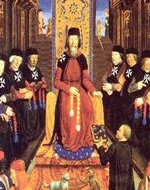 European knights of the Order of St John, ejected from the Holy Land, established themselves on Malta as a military/religious aristocracy under the autocratic rule of the "Grand Master." After the Ottoman defeat at Lepanto in 1571 the Order's usefulness as Christian shock troops was spent. Ambitious and irredeemably avaricious, the knights established Europe's largest slave market, spent a fortune on palaces and fortresses, and introduced the Inquisition. They also introduced a Christian "tradition" that the apostle Paul had been shipwrecked on their island. The claim helped the decadent "warrior-monks" go on extracting loot from their European patrons for the "protection of holy places." The annual rent for the island paid by the Order to the Spanish crown was one peregrine falcon. St Paul makes landfall – the "shipwreck" site? 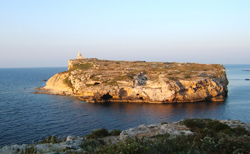 Eschewing the Greek tradition attached to an island in the north Adriatic, the Latin knights, backed by the Pope, chose this bay on the northwest coast of Malta for Paul's landfall. Over the years many other bays have been proposed for the apostle's shipwreck, each supported by special pleas that they "best fit" the less than adequate clues in Acts. As late as the 19th century, the wreck site was transferred from the shore to the more picturesque islet of Salmonetta on the edge of the bay. A statue was erected and the name changed to St Paul's Islands (in reality a single island with a low-lying bridging section). It looks appropriate but Paul's ship could not have ran aground on this islet because the survivors would then have had to be rescued from the island! This awful modern church astride the road in St Paul's Bay claims to be built on the very spot where Paul encountered his snake and impressed the locals. Nearby is where St Paul tried his first cheeseburger. Only kidding. Two of the greatest cities of the pre-Roman age were within easy sailing distance of Malta: Carthage (founded by Phoenicians from Tyre in 814 BC); and Syracuse (founded by Greeks from Corinth in 743 BC). After great destruction both cities were rebuilt as provincial capitals within the Roman empire. Contact with Malta must have been frequent and sustained. The Itinerarium Antoninianum lists the island as a port on the Italy-Africa run. Arabs deposed the last of the Byzantine rulers in 870 and the locals adopted many aspects of the invader's culture, including agriculture, Islam and Arabic (the basis of the Malti spoken today). Roger the Norman took the island in 1090 and introduced feudalism. The island passed to Frederick II, the Holy Roman Emperor, who expelled the Muslim population and used the island as a penal colony. Eventually, possession of Malta passed to the Spanish crown. Malta has few natural resources, but with its many deep harbours the island remained strategically important to the world's navies from the time of the Crusades through to the end of World War II. Naturalists say there are NO venomous snakes on Malta – and there never were. "I have given you authority to trample on snakes and scorpions and to overcome all the power of the enemy; nothing will harm you." – Luke 10.19. Standing eloquent testimony to the sophistication of urban living in 1st century Malta – and just four miles from the purported site of St Paul's "shipwreck among barbarians"! 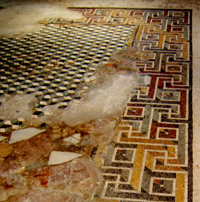 These remarkable polychromatic mosaics are from a Roman town house. Roman beehives from the 1st century AD, St Paul's Bay, Malta. San Pawl Milqi, Bumarrad, Malta. An original church was built here in the 1488. The Maltese word "milqi" is translated as "welcome" to fit in with the Pauline fable, though a truer rendering would be "healing", perhaps indicative of an ancient spring. The pretensions of Malta are supported by the Vatican but not all churches. A rival claimant is Mljet (Meleda), located near the coastal city of Dubrovnik in Croatia. Mljet – and its own wrecksite! Excavations on Mljet have identified an "early" Christian basilica (no surprises there) which "local tradition" conveniently links to an original church founded by St. Paul. One thing that Mljet has over Malta is that venomous snakes were common until the 20th century. Greece, too, now has a favoured site. In August 1999 the Church of Cephalonia made a serious bid for the accolade of Paul's shipwreck with the help of Dr. Heinz Warnecke, an evangelical German with expertise in sea currents and maritime navigation. Warnecke argued that "Phoenix," the intended destination of Paul's ship, was not a port in Crete but Phoinikounta in the Peloponnese. Warnecke's work underscored the impossibility of a wreck on Malta. Armed with proof of what was not possible, Cephalonia's claims were at least as good any other island with a tally of ancient wrecks (all 10,000 of them). As a cruncher the unbiased doctor argued that the Argostoli peninsula must once have been known as Melite. The local Metropolitan has not "spared effort nor expense" to promote wider acceptance of the claim. Somehow I don't think Malta will be ceding its nice little earner anytime soon. Acts 16.10-17: "Luke" joins his hero at Troas on the coast of Roman Asia but soon after, when the apostle is arrested in Philippi, he "disappears" and is no longer part of team Paul. He misses all the subsequent fun in Thessalonica, Berea, Athens, Corinth, and Ephesus and the voyage back to Antioch. In fact, "Luke" misses Paul's entire 3rd mission, including two years spent in Ephesus! Acts 20.5-15: Years later, laid back "Luke" rejoins his hero at Philippi and takes the return sailing to Troas. Acts 21.1-18: "Luke" shares Paul's voyage home to Caesarea; he also stays with Philip and goes with Paul to Jerusalem to face the heavies. But once again when Paul is arrested "Luke" makes himself scarce. For two years Paul languishes in Felix's gaol but where is "Luke"? Working on his sun tan? "When it was decided that WE would sail for Italy, Paul and some other prisoners were handed over ..."
"Luke" may have missed all the preliminaries but he's there for the big finish! The ripping yarn of Paul's voyage to Rome is devoid of theology but includes several curious "miracles" and a wealth of nautical detail which is a delight to those who argue for Luke's "accuracy as an historian." Below the surface, however, the author of Acts has drawn on at least two, and possibly several, incompatible sources to concoct his tale of maritime adventure and evangelical pizzazz. 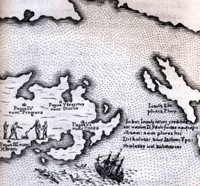 The climax of the fable is a shipwreck on the island of "Melite" – first associated with Malta in the 16th century by the Knights of St John, crusaders who had been kicked out of the Levant and the island of Rhodes and had established a military despotism on the tiny but strategically placed rock. Centuries earlier, an alternative – and better – claim to the holy wreck site had been made for an island off the Dalmatian coast by Benedictine monks. They drew on the work of the the 10th century Greek emperor Konstantin Porphyrogenitus, who had identified, in his book On Administering the Empire, the island of Mljet with the castaway apostle. Like Malta, in antiquity Mljet had been called Melita. In recent times a third location has been trumpeted for the unplanned landfall, Argostoli on the island of Cephalonia, enthusiastically backed by the local clergy for obvious reasons. All three claims are attempts to imprint the Pauline fable onto real geography and real history. Yet like the multiple heads of John the Baptist, the proliferation of "evidence" merely underlines the hollowness of the supposed final voyage of the martyr-saint. A shipwreck on Malta? Dalmatia? Cephalonia? The centurion ... commanded that they which could swim should cast themselves first into the sea, and get to land. And the rest, some on boards, and some on broken pieces of the ship. And so it came to pass, that they escaped all safe to land." "Adria" (Αδρια – the Adriatic), a few place names from before the fatal storm, and "where two seas met" (just about anywhere) are our only clues to Paul's escapade at sea. Even if we stretch "Adria" to include the area of ocean between Sicily and Crete (as do some writers from the 2nd century) we are no wiser. There is also some puzzlement regarding the tempest which supposedly blew for fourteen nights and carried Paul's ship five hundred miles due west, yet at the same time raised fears of hitting sand banks four hundred miles to the south! In autumn, prevailing winds in the Mediterranean are from, not to, the west and "Luke" invokes a particularly strong contrary wind called either a Euroclydon or Euraclydon (that is, a southeasterly or a northeasterly), depending on the manuscript. "But not long after there arose against it a tempestuous wind, called Euroclydon." – Acts 27.14. Adding to the confusion are the Latinized forms Euroquilo / Euraquilo and the modern Gregale. To fit with "Luke's" story the storm had to arise in the mountains of Crete, as some versions of Acts freely translate. Yet this can scarcely be the same storm that lashed the island of Malta a fortnight later. The Gregale that batters Malta in winter can last five days but normally abates after two. Increasingly, "Luke's" story looks like a fisherman's tale. Perhaps, in reality, the author is simply invoking a "mighty storm," as in that other maritime fantasy, the tale of Jonah! Winds might blow in any direction but one thing that has not changed in the last two thousand years is the circulation of the Mediterranean. The major currents are driven by waters flowing east through the Straits of Gibraltar and south from the Black Sea. Water returns to the Atlantic via the Italian coast or is lost in evaporation. Currents in the Aegean sea are predominantly southerly and across the north African coastline flow eastward and then northward along the Levant. A vessel sailing west from the port of Myra in Roman Asia would have been extremely unlikely to shipwreck on the north coast of Malta, fifty miles south of Sicily, whatever the wind. Unlikely, but not impossible. Unfortunately for the salesmen of Christ, nothing else about this Robinson Crusoe story fits either. Arrows indicate major currents. 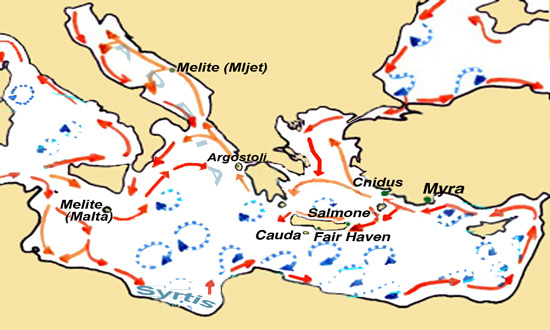 The Syrtis sandbanks of the North African coast were a known hazard in antiquity and to avoid the dangers of the mid-ocean most ships followed the coasts of Asia Minor, Greece and Italy. Grain carriers from Egypt would catch the northerly winds at Myra. By the time our intrepid heroes leave Fair Havens – the real starting point of this maritime adventure – "the fast was already past" (Acts 27.9), that is, it was after the Day of Atonement. This festival was supposedly instituted by Moses, making amends after the embarrassing episode of the golden calf (3000 misguided calf fans were slaughtered but we will overlook that bit). The important point is that the festival itself, linked to the lunar calendar, can fall anytime between mid-September and early October. So at the latest, team Paul left Crete by mid-October. With fair winds from the south, the captain decided to make for a safer harbour at Phoenix, a few hours away. But a violent change in the weather turned into a 14-day mother of a storm. The shipwreck thus occurred around the end of October. "Luke's" location markers don't make sense either. He mentions the island of Cauda (aka Clauda), just south of Crete, and then the Syrtis sandbanks – 400 miles away! Even "Luke's" super-storm could not have achieved such transport! "Running under the shelter of a small island called Cauda, we were scarcely able to get the ship's boat under control. After they had hoisted it up, they used supporting cables in undergirding the ship; and fearing that they might run aground on the shallows of Syrtis, they let down the sea anchor and in this way let themselves be driven along." – Acts 27.16-17. The idea that Paul "admonished" the centurion about where the ship should winter (Acts 27.9) screams literary invention and theological purpose. Note that the centurion does not "believe" Paul (27.11). Is it all a story of a voyage to faith? The apostle's intrusion serves to elevate Paul as the most important person on board the ship, and yet he was purportedly a prisoner, with no evident maritime expertise, certainly not of a voyage to Rome familiar to the captain of a giant grain carrier. On the vessel are 276 passengers and crew (though Codex Vaticanus, among others, gives a far more modest "about 76"). Although the voyagers don't yet know it, their eternal fate is in the hands of our wise apostle. Against the advice of Paul to stay in "Fair Haven," the judgement of the helmsman and the captain to sail a little further and winter in Phoenice carries the argument. Man's folly prevails over God's wisdom. But the apostle was to be proved right. The craft does not make Phoenice after all but is pushed by a squall towards Cauda and on into a 14-day tempest. Curiously, whilst everyone else battles to save the ship, Paul is able to take a "long abstinence" (27.21)! But not really curious – in this melodrama Paul already has one foot in heaven. Other people scamper around trying to secure the boat but not our man of God, with his thoughts on eternal salvation. An angel has reminded him that his destiny was to be fulfilled in Rome. Like Superman appearing moments before the train wreck, "Paul stood forth in the midst of them." Then the soldiers cut off the ropes of the boat, and let her fall off." – Acts 27.30-32. At the darkest moment ("about midnight"), and surmising that land was close, the despairing sailors (who surely knew a thing or two) decide to save themselves by launching the ship's boat. But our imperious apostle is having none of it. The sailors are to be saved by Paul whether they like it or not. The soldiers, now taking commands from the apostle, cut the boat adrift, leaving only one option for the whole company – Paul's declared intent, "We must run aground on a certain island." At this point, Paul inflates in triumph (one can almost see the ethereal glow that surrounds him) as the vessel drifts in outer darkness ("neither sun nor stars"). The apostle reassures the whole complement of passengers and crew that "all will be saved" and is so insouciant he even suggests they tuck into "meat." The others have not eaten for a fortnight, but Paul – a prisoner! – helps himself to bread, even observing the Eucharistic formula (taking, thanking, breaking, and eating)! (27.35). We are, of course, in Church and membership is compulsory. Hope is our anchor in a storm-tossed life and those lost in spiritual darkness will be saved by holding steadfast to Christ! After "supper", all onboard set to lightening the ship by throwing the cargo overboard. When dawn broke they are lost but espied "a creek with a shore" and ran aground. The soldiers, who had but recently taken orders from Paul, inexplicably are now anxious to kill the prisoners "lest any escape." But the "kind centurion" (a stock figure in the New Testament yarn) is having none of it, and orders all who can to get to shore – and all do. "And when they were escaped, then they knew that the island was called Melita. And the barbarous people shewed us no little kindness: for they kindled a fire, and received us every one, because of the present rain, and because of the cold." – Acts 28.1-2. Apologists are quick to explain away "Luke's" use of the word barbarians (βαρβαροι) for the residents of the island of Melita with the argument that they spoke Punic, not Greek. Yet "Luke" himself pulls the wheels off this subterfuge by having his natives invoke Dike, the Greek God of Justice! The author does not have civilized Punic-speakers in focus but simple, Greek-speaking folk whose words he self-evidently was able to both understand and record! These "barbarians" kindle a fire for the arrivals and yet, if Melita is indeed to be equated with Malta, within walking distance of the shore were Roman villas. Who would stop to kindle a fire in a rainstorm when they could so easily walk to shelter? What sort of fire would be sufficient to warm 276 wet survivors? "Luke's" Melita is an imaginary landscape into which the historical Malta has been melded. The Romans first took an interest in Malta during the First Punic War when, in 255 BC, they attacked Carthaginian settlements. The historian Livy recounts that the islands were conquered by Tiberius Sempronius Longus at the beginning of the Second Punic War (218 BC). The consul crossed from Sicily, barely fifty miles away, in his search for the Carthaginian fleet. Subsequently, Malta and Gozo were incorporated into the newly organized province of Sicily, Rome's first overseas possession. Thereafter, the Maltese islands shared Sicily's laws and rapacious governors. The Roman presence continued in Malta for more than a thousand years, until the Byzantines were expelled by Arab invaders in 869 AD. The capital of Romanised Malta was Melite, built over the earlier Carthaginian city. At least as large as the modern town of Mdina-Rabat, the Roman city had the normal assortment of civic amenities. 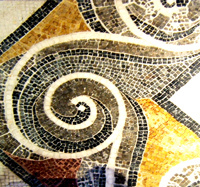 A particularly splendid villa (Domus Romana), dating from the Republican era, was discovered in the 19th century. Locally minted coins were in circulation at least as early as 1st century BC. Fine mosaics, marble statuary and even extant beehives (Melite means "honey") amply demonstrate that the island was fully integrated into Rome's trading empire, as written sources confirm. "The island of Melite, gentlemen, is separated from Sicily by a rather wide and dangerous stretch of sea. In it there is a town, also called Melite, which Verres never visited, but which none the less he turned for three years into a factory for the weaving of women's draperies." – Cicero, The Verrine Orations, 11,4,103, 1st century BC. "Melite ... and its inhabitants are blessed in their possessions; for it has artisans skilled in every manner of craft, the most important being those who weave linen, which is remarkably sheer and soft ..."
– Diodorus of Sicily, Book V.12, 1st century BC. It was rumoured that Gaius Verres, the notorious governor of Sicily (73-71 BC), sent to Malta for roses with which to stuff his pillows. In no sense, then, were the residents of the island to be described as "barbarians" who camped about bonfires and were easily impressed by stranded rabbis brandishing mirrors and bracelets. In Paul's case it was charm over venomous snakes – and therein lies the next "difficulty." And he shook off the beast into the fire, and felt no harm. Howbeit they looked when he should have swollen, or fallen down dead suddenly: but after they had looked a great while, and saw no harm come to him, they changed their minds, and said that he was a god." – Acts 28.3-6. We are told by the book of Acts that soon after his arrival on Melita, Paul was bitten by a viper hiding in drift wood. Showing no ill-effects from the bite, his survival rapidly elevated him in the minds of the impressionable natives from evident murderer to certain god. As if. The Maltese islands have endemic species of geckos, lizards and rodents. Snakes are not entirely unknown but certainly the islands have no venomous "vipers" (έχιδνα). More embarrassing for apologists is that zoologists say there never were, even in antiquity. In any event, the natural habitat of the viper is not driftwood on the shoreline but dry and rocky hillsides and it spends the winter months in hibernation. Even if we allow for the import, either deliberately or inadvertently of a few poisonous specimens particularly suited to the Maltese coastline in winter, they would not have become so commonplace for a platitude of folk wisdom to have emerged that a snake bite "implicated a murderer." No less ludicrous is the claim that the locals so readily embraced Paul as a new "god". Cult centres of the Phoenician goddess Astarte had existed in Malta for centuries before the Romans arrived (at Tas Silq, Marsaxlokk, etc.) By the "time of Paul" the residents had been "allies" of Rome for three hundred years and the sanctuaries of Astarte had been developed into Roman temples, with the goddess herself assimilated into the worship of Juno. In the 2nd century, Ptolemy mentions sanctuaries to Hercules and Hera. Far from converting the whole island to Christ one could say that the evidence is "as if" Paul's visit never really happened! Understood allegorically, however, the tale makes perfect sense. Tossing a snake into the fire signalled the victory of the apostle over the devil and the triumph of the new faith over paganism. Who also honoured us with many honours; and when we departed, they laded us with such things as were necessary. And after three months we departed in a ship of Alexandria, which had wintered in the isle, whose sign was Castor and Pollux." – Acts 28.7-11. By chapter 28 "Luke" is keen to bring his tale of Paul's missionary triumph to its inevitable (if rather wimpy) climax at Rome. He says not a word about evangelical work on the island of Melita (yet Paul's stay – three months, we're told – was considerably longer than the time spent in many of his venues). Instead "Luke" provides healings, principally of the father of the chief man (the latter known only by his Roman praenomen Publius). However, Christian "traditions", invented soon after the expulsion of the Muslim population in the 13th century, made up the shortfall. It seems that the whole island was converted to Christ (!) and that the Roman governor Publius accepted from Paul his appointment as "first bishop"! It's said that Publius went on to fill the shoes of the martyred bishop Dionysus of Athens and himself died a martyr "in the lions den." Which makes it all the more odd that a vibrant pagan culture remained on Malta long after the Christian evangelist purportedly washed up on the shore and that a very early Christian presence is not in any way evident. The first signs of the existence of a Christian community on Malta are no earlier than the official conversion of the empire. As we find throughout the whole eastern Mediterranean, there is no evidence of the Christian religion on the island prior to the 4th century. "The tradition of the appointment of Publius as the first bishop of Malta is the result of a confusion with another Publius, bishop of Athens, several generations later. And it would serve no purpose to continue to uphold it." – Anthony Bonanno, Malta, p200. This somewhat modern looking water feature apparently marks the spot in St Paul's Bay where the apostle conjured up water for his shipwrecked companions by striking a stone. Or, if you prefer, it is the spot where he performed mass baptism of the "natives". In fact, the original fountain was a novelty erected in the 15th century by a Grand Master of the Knights of St John. A "sacred fountain" strengthened the Order's claims to still protect "holy places" after being kicked out of the Holy Land. Alternatively, if your faith can withstand recognizing that there was a Roman presence on the island for 300 years before Paul washed into town, the whole drama of conversion can be shifted to a hill a mile or so away and the site of an ancient farm. It is here that the local governor "is said" to have had a residence and put the new arrivals up for three nights. When Paul cured the sickness of his father he converted to Christ and accepted the job of first bishop! What a nice guy. Not far away from the bay and its fountain is St Paul's "grotto." This subterranean chapel masquerades as the "home" of St Paul during his three-month stay on the island (not exactly Roman central heating here.) Holes in the ceiling apparently were used to tie the apostle in some sort of punishment – presumably when he wasn't curing the sick and converting the whole island to Christ! St. Paul's Grotto, Rabat, Malta – conveniently placed beneath a 17th century church. 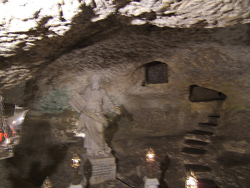 So effusive was the apostle's temporary residence in the cave that the locals were able to sell fragments of rock as a protection against shipwreck and as a cure for snakebite! See, they weren't so dumb! The grotto is not to be confused with St. Paul's Catacombs a short pilgrim's walk away. 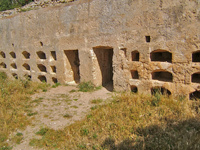 The extensive necropolis was in use by pagans, Jews and eventually Christians from Punic times until the 16th century. Part of the labyrinth now has a separate existence as St Agatha's Catacombs – so-named for the famous martyr of multiple deaths. Agatha is commemorated along with other saints in frescoes in the crypt added during the 12th-15th centuries. In the late 17th century the remains of a villa in the grounds of a church near St Paul's Bay, San Pawl Milqi, came to light and were promptly associated by the Christian faithful with Publius, the "chief man of the island" who supposedly had hosted St Paul. An innocent Roman water cistern that had supplied the villa was given cultic significance: "Paul's baptismal font"! In fact, several other villa sites were already known and had also been associated with the apostle – all without a shred of evidence. Well, he must have stayed somewhere, right?! Church records attest to an earlier church – the site chosen doubtless because of the ready availability of building spoil – but notably make no reference to any "ancient Pauline tradition," clear evidence that a "past" had but recently been invented. In truth the Roman farm produced olive oil in the 3rd and 2nd centuries BC – and shows evidence of burning down before the time of any apostle. It was rebuilt in the 5th century. 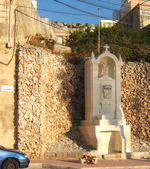 In 1818 Pope Pius VII gave part of a white pillar to Malta to be "venerated by the Catholic Faithful." The claim was that the lump of marble was cut from the very pillar upon which St Paul was beheaded, the remainder of which remains at the Church of the Three Fountains in Rome. Put the two parts of the pillar together and the apostle must have stood on a ladder for his beheading! The "three fountains" part refers to the apostle's head bouncing three times and three fountains bursting forth – in reality, the water source of a pre-Christian pagan shrine, the Aquae Salviae. 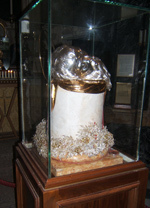 The silver head shown here is said to include "bones from the apostle" and we can be sure it contains some bones! 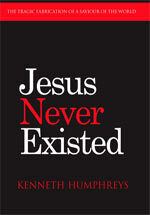 "Nor is there any written reference before the fifth century AD to Christianity in Malta (St Jerome). Even in the archaeological record, there is a total absence of any reference of Christianity prior to the fourth century." – Anthony Bonanno, Malta, p201. "Luke" never once suggests that he (nor Aristarchus for that matter) shared Paul's arrest. It therefore seems extraordinary that these "fellow conspirators" could have just bought their way on board not one but three "prison transports." But then other considerations make it very obvious "Luke" was not an eye-witness or companion of any Paul. Indeed, there is a very telling alternation between first and third person passages in the text of Acts which betrays the seams of construction. The "shipwreck melodrama" is one of those few passages of Acts where the author writes himself into the action. More than one of his "source document" can be identified – documents written and widely available at the time that "Luke" assembled the story. The satirist Lucian of of Samosata (c. 120-180), in a tale of four friends amusing themselves by wishful thinking known as The Ship (or The Wishes), begins his dialogue with an account of the grain ship Isis. On its voyage from Egypt to Rome the giant vessel had been driven by a storm into the Athen's port of Piraeus. Parallels, both in plot elements and language, with the shipwreck story in Acts are quite "uncanny." "They set sail with a moderate wind from Pharus [Alexandria], and sighted Acamas [western cape of Cyprus] on the seventh day. Then a west wind got up, and they were carried as far east as Sidon. On their way thence they came in for a heavy gale, and the tenth day brought them through the Straits to the Chelidon Isles [the Dodecanese? ]; and there they very nearly went to the bottom. I have sailed past the Chelidons myself, and I know the sort of seas you get there, especially if the wind is SW. by S.; it is just there, of course, that the division takes place between the Lycian and Pamphylian waters; and the surge caused by the numerous currents gets broken at the headland, whose rocks have been sharpened by the action of the water till they are like razors; the result is a stupendous crash of waters, the waves often rising to the very top of the crags. This was the kind of thing they found themselves in for, according to the master – and on a pitch dark night! However, the Gods were moved by their distress, and showed them a fire that enabled them to identify the Lycian coast; and a bright star – either Castor or Pollux –appeared at the masthead, and guided the ship into the open sea on their left; just in time, for she was making straight for the cliff. Having once lost their proper course, they sailed on through the Aegean, bearing up against the Etesian winds, until they came to anchor in Piraeus yesterday, being the seventieth day of the voyage; you see how far they had been carried out of their way; whereas if they had taken Crete on their right, they would have doubled Malea, and been at Rome by this time." How many ships, bound for Rome, and carrying a cargo of priestly Jewish prisoners for trial before Caesar, are likely to have been shipwrecked about the year 63 AD – and to have left an historical record? Josephus was on one such ship. He swam all night, finally being saved by another ship and taken, like Paul, to Puteoli. Accordingly I came to Rome, though it were through a great number of hazards by sea; for as our ship was drowned in the Adriatic Sea, we that were in it, being about six hundred in number, swam for our lives all the night; when, upon the first appearance of the day, and upon our sight of a ship of Cyrene, I and some others, eighty in all, by God's providence, prevented the rest, and were taken up into the other ship. And when I had thus escaped, and was come to Dieearchia, which the Italians call Puteoli." The 1300-word "drama at sea" of Acts 27-28, which serves as a preamble to Paul's triumphant entry into Rome – chains and all! – combines a travel romance in the Hellenistic tradition with a clear theological purpose. Confident in his divinely prescribed destiny, the apostle towers over centurion, sea captain and island governor alike. Forthright before "powers," resolute when others falter, humble yet imperious (just like JC himself), death, for the moment at least, is defeated, both for Paul and all who sail with him. The yarn is not history but it has an historical purpose: to capture for Christ a ship of souls – or is that a ship of fools? Gordon Franz, The Sinking of "The Last Shipwreck of Paul" (May 15, 2005). Journey's End – or End of the Line?